What a game of football that was. Not a solid defensive performance in sight. Tomorrow we have nine matches with four kick-off times spread over nearly 10 hours. Fill your boots and join us! Arsenal boss Arsene Wenger, speaking to Match of the Day: "We played frozen with fear and not at our level in the first half. In the second half we played at our level. It was a thrilling game. I am frustrated at not winning but that is the type of game you want in the Premier League. "The good thing is that overall we did not give up. The spirit is fantastic. On that front I am proud of the players. It shows a strong mentality. We have the capacity to respond. What you want is for the team to realise that we have to start from the first minute. "They knew that Liverpool had pace up front and maybe when you prepare for a game you want players to be ready but you make the opponent too big in the heads of your players. "More for people who love football, let's give credit to the creative force. If you have no shots on goal the defences look good but that is not what people want to see." Arsenal fail to get the balance right between attack an defence continuously against the big teams. Granit Xhaka is simply not good enough to control the midfield in the Premier League and they need to go out and spend big money on a world class central midfielder. Liverpool boss Jurgen Klopp, speaking to Sky Sports: "You need to be angry with yourself, not sad or insecure. We came back into the game and scored our third. The point is the minimum we deserve. Because of the intensity of the game it was not easy to create clearer chances. When you get a point at Arsenal it is usually OK but after this give me a few minutes to get there. "Three goals at Arsenal should be enough. We defended most of the time pretty well. We did not give space away. After they score the first and the second, it is not easy but we need to deal with these situations better." On Simon Mignolet's error for Arsenal's second goal: "He misjudged it. A second hand would have helped but that is how it is. You don't need to make it bigger than it is. It felt like we shouldn't have conceded but we did. "Defending is a team thing. Today we make individual mistakes and that is not cool. My job is to think about the performance and that was a winning performance. If you want, the draw is our halfway win. We are always a better side when we draw. We have to take the good things and work on the lesser good things." Jurgen Klopp's reaction to being told that his side conceded three times in four minutes and 45 seconds was top class. Jurgen Klopp to BBC Sport: "It is difficult to explain, we should be three, four even five-nil up before we don't defend a cross. It feels really strange. "A point at Arsenal is a good result for most teams in the world but it feels not too good at the moment. "We made mistakes on both sides of the game but it is unlikely to win 6-3 or something at Arsenal. We didn't take all of our chances but three goals should be enough. Arsenal were not in the game apart from 10 minutes." The best way for Liverpool to win is to beat you in half an hour - if they get into the rhythm they were in in the first half and put the chances away, they win the game. The longer a team is able to hang on, the less likely it is Liverpool will get a result. Their one way of playing, inability to adapt their style, it is a fault to an extent - but it is just the way Jurgen Klopp is. Klopp has had 4 transfer windows since he became Liverpool manager... and still we have Mignolet in goal. How many times is he going to cost us games?! There are VERY good goalkeepers available next month - a certain Jack Butland would fit the bill nicely! 'All three goals are avoidable' - it's safe to say Jurgen Klopp agrees. Liverpool defender Andy Robertson, speaking to Sky Sports: "It was 90 minutes of two teams attacking at high speed. There were mistakes but the tempo it was played at, the boys are still trying to get breath back. You're most vulnerable when you score and that happened to us. They had an extra yard and we made mistakes. We got our composure back a little too late. "First half we dominated. We have just had a lapse of concentration and it has cost us two points. All three goals were avoidable. We need to get these mistakes out of our game." Asher: Only the Ozil goal was out of sheer brilliance, video clips of the other 5 should be repeatedly shown to young academy players as examples of what happens when you forget how to defend! Fabian Perez: Take a Bow Mr Phil Dawkes. Can you take on Lawro every week please? Both teams are capable of putting in displays going forward, but equally capable of falling apart. A draw was the right result in the end. It is crazy. From an entertainment point of view it's had everything - great goals, mistakes, attacking play. From a purist's point of view you could tear both teams apart - Arsenal's application in the first half, leadership in second half from Liverpool and the ability to control the game. A great advert for the @premierleague. Not a great advert for defending or goalkeeping! In the first half Liverpool controlled things. Somewhere along the line they lost confidence in the way they played and became more susceptible to Arsenal's attacks. The keeper is a major issue. For a club as big as Liverpool they need someone better between the sticks, as simple as that. Noel Fitzpatrick: I've seen grandfather clocks with stronger hands than Mignolet's!!!! Arsenal defender Ainsley Maitland-Niles: "English football has changed, there are a lot of counter-attacking teams now, it’s like basketball. "I did OK, there are things to work on but I am getting there slowly. We are not happy, we should have won the game. When you are ahead there is no reason to drop points." Three goals in four minutes in the Premier League is ridiculous. For a team that has aspirations of winning the league, not this season but soon, that is not how you win anything. 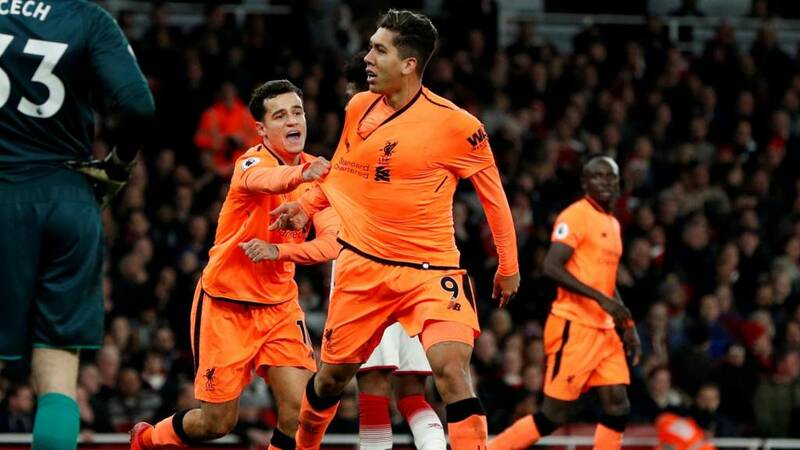 Liverpool were in full control and I don't think Arsenal did that much to get back into it - it wasn't like they put together unbelievable moves. I really enjoyed it, it delivered on every aspect from a spectator's point of view.